SnagFilms has acquired exclusive digital rights to a number of new films, including “We Made This Movie,” directed by “Late Show With David Letterman” executive producer Rob Burnett; drama “Faces in the Mirror,” directed by Boyd Tinsley of Dave Matthews Band; and “Black Tulip,” Afghanistan’s official entry for the 2011 Academy Awards. The slate also includes Joe Berlinger’s 2012 Sundance Film Festival documentary “Under African Skies,” which features Paul Simon. SnagFilms’ rights vary with each title and the company is in the process of determining release windows that will begin this summer and fall. SnagFilms is the parent company of Indiewire. The release follows. New York, New York — March 12, 2012—SnagFilms has acquired a variety of exclusive rights to a new slate of documentaries and fictional feature films, it was announced today. The films include the world premiere of We Made This Movie, directed by Rob Burnett (The Late Show with David Letterman executive producer and president and CEO of Worldwide Pants), the new drama Faces in the Mirror, conceived and directed by Boyd Tinsley of Dave Matthews Band, and Black Tulip, Afghanistan’s official entry for the 2011 Academy Awards. 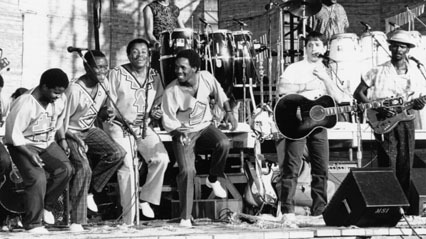 The slate also includes 2012 Sundance Film Festival documentary Under African Skies, starring Paul Simon. SnagFilms’ rights vary with each title, and the company is in the process of determining release windows to commence this summer and fall. This announcement follows SnagFilms’ recent acquisition of 27 titles during the Sundance Film Festival in January, including previous Sundance Festival Winners Kinyarwanda, We Live in Public, Manda Bala and Academy Award nominees Enron: The Smartest Guys in the Room, Super Size Me, Jesus Camp and Operation Homecoming: Writing the Wartime Experience. Black Tulip is a drama shot entirely on location in Afghanistan, and was the country’s official entry for the 2011 Academy Awards. After the Taliban is routed from Afghanistan in early 2001, the Mansouri family seizes the new window of freedom by opening a restaurant called “The Poet’s Corner,” where artists and poets are welcome to express themselves on a small stage. This newfound hope proves to be fleeting as lingering factions of the Taliban threaten to silence them. Conceding to the Taliban’s demands goes wholly against their beliefs and for what they’ve fought for. Having come a long way from refuge and expatriation overseas, giving up now is not an option for this Afghan family. Based on a true story, Black Tulip is a frightening and inspiring film about the immeasurable value of freedom and the tenacity of culture and tradition, where there is always a price. Black Tulip was directed by Sonia Nassery Cole and produced by Breadwinner Productions. For more information, please visit www.blacktulipfilm.com. Faces in the Mirror is a new drama conceived and produced by Boyd Tinsley of Dave Matthews Band. In unusual reversal of the standard artistic process, the concept for the film began with its music, produced by Tinsley and performed by members of Dave Matthews Band, including Stefan Lessard, Tim Reynolds, Boyd Tinsley and Dave Matthews, along with musician Shawn Smith and music groups Maktub and The Silent Comedy. Tinsley has said, “Faces In The Mirror is a dance of film and music. It is a fantasy, a journey that leads us from one portal to the next. It is a story, that not so much we tell, but one that is told through us.” The film was directed by Aaron Farrington, produced by Ryan Gall in addition to Tinsley, and features special material written and voiced by former Poet Laureate of the United States, Rita Dove. Under African Skies had its acclaimed debut at the 2012 Sundance Film Festival. Legendary artist Paul Simon returns to South Africa to explore the roots of his historic Graceland album on its 25th anniversary, including the political backlash he received for allegedly breaking the UN cultural boycott of South Africa designed to end the Apartheid regime. Renowned filmmaker Joe Berlinger brilliantly intertwines both sides of a complex story as Simon revisits old ghosts and gains insights on his own musical journey. Features compelling perceptions of antiapartheid activists and music legends such as Quincy Jones, Harry Belafonte, Maya Angelou, Paul McCartney, Lorne Michaels and David Byrne, Under African Skies is a @radical.media production and is being released in conjunction with Sony Music, and will premiere on A&E. Music will be available from Sony Music Entertainment’s Legacy Recordings in June (www.graceland25.com). We Made This Movie is the hilarious and heartbreaking story of five high school seniors trying to escape their hometown by making their own lowbrow comedy movie – and finding that their friendships are tested when their cameras begin capturing their actual lives. It was directed by Rob Burnett (five-time Emmy winner, executive producer of The Late Show with David Letterman, and President and CEO of World Wide Pants), and written and produced by Rob Burnett and Jon Beckerman (Emmy winner, former headwriter and supervising producer of The Late Show with David Letterman), who together were the co-creators of the critically acclaimed TV series Ed. Albert Berger and Ron Yerxa (Election, Little Miss Sunshine) were executive producers. The film is a Worldwide Pants, Bona Fide and B&B Production.